Dan John’s Newest Video—Now What? After you finish your assessments, do you often find yourself wondering, now what? In his video presentation, Now What? After Assessment, Now What?, Dan will help you answer that important question. In this two-and-a-half-hour lecture, Dan outlines his thinking of what happens after assessment—yes, assessment is important, but then… Now What? Dan begins with a discussion of assessments, what to measure and why. Included in that section of the talk, you’ll find his overview of his work in Can You Go?—his book in which he shows the difference between active athletes and everybody else. And then he quickly gets to the big question, “Now what?” What do we do next? Here’s where we get to the meat of the lecture as he talks about “shark habits” and “pirate maps” for health and longevity, and shows us how to separate those needs and chores from athletic performance. Either for yourself or your clients, you’ll learn how to shark habit things that need to be done occasionally and pirate map those that are ongoing. How can you get things done? Sharks and pirates. And then you’ll sit up straighter as Dan gets to the performance side of things…principles, peaking, planning and programming. What do athletes need, how do they become elite, and how can you help them thrive? In this section Dan’s going to guide you through this maze of preparing an athlete for performance. And then he’ll leave you with his APE concept—Accept, Practice and Experience—where he’ll pull everything together so you can apply his new material in your life and with your clients…tomorrow. In the over 30 years Dan John has been lecturing and writing about the art and science of strength coaching, he now considers “Now What?” to be his best work. 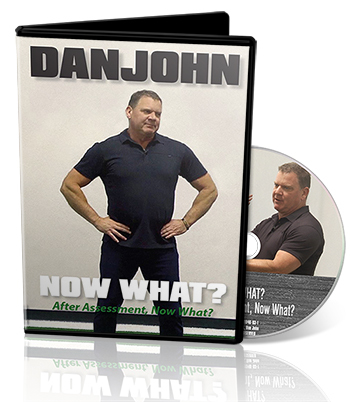 Click below to buy your copy of Dan John’s Now What Lecture Video today. Attention strength and athletic coaches! IF you are serious about truly “developing” your athletes, become a disciple of Dan John. Easy strength, Intervention, Can You Go, and now…NOW WHAT. The thing I love about Dan is that his message never changes…but with each resource you feel like you are discovering something new. Perhaps it is like G.K.Chesterton’s intrepid explorer in “Orthodoxy” who bravely plants the flag in a new world only to discover that he has “found” England! (Maybe Dan will appreciate the analogy! He is a religion teacher!) Being a pastor, coach, and lifelong strength enthusiast, perhaps I’m a bit biased. But then again, I’m just simply telling you the truth. The physical DVD is a 2-disc, 145-minute DVD set.